Top of Tyler’s Christmas this is the Nintendo 2DS I blogged about earlier on in the week. Electronics feature high on my children’s Christmas list, but I’ve tried to incorporate a mixture of both on the list here. I’d love to know what’s on your child’s Christmas list this year. I thought I’d start with the Battroborg, this is a bit like a mini robot wars. It’s battling robots, which are controlled via a remote control. 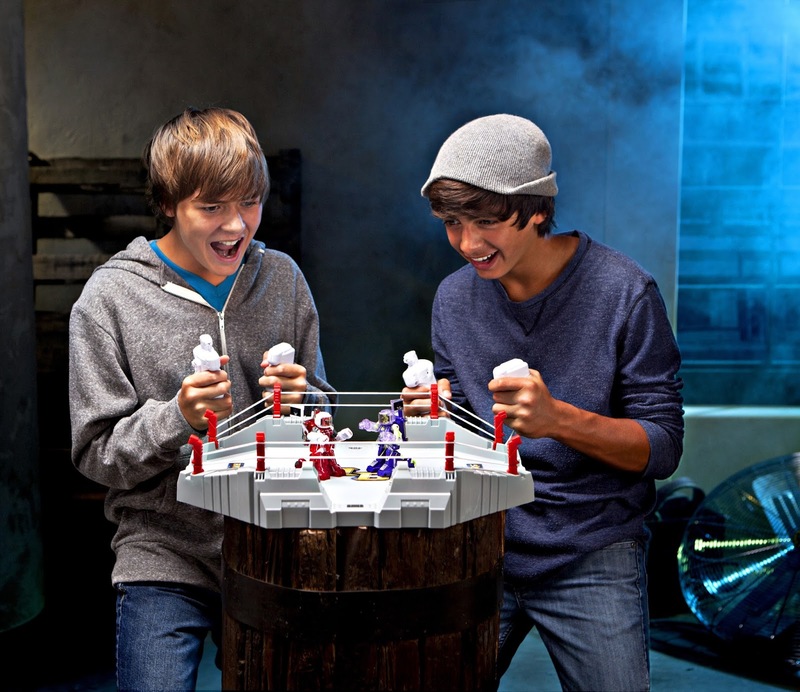 Battroborgs are motion controlled battling robots that let players control the action in the ring. Each Battroborg can battle in three different, competitive game modes; Combat, Autodrone, and Tag. The players are virtual battlers, controlling the action and the points are recorded on a damage level via an LED light. The Robot’s change colour each time they get punched. Five punches equals a defeat as does a knock over. The Battronborg comes with a quick 20 minute charger. This is some fast action fun, which my boys enjoyed, but to enjoy it to it’s full level I’d says it’d be suitable for 8 year olds. You can buy other robots and have tournaments. It’s great for putting out on the kitchen table and enjoying the fun there is to be had. Encourages competitiveness and they are funny when they fall over. 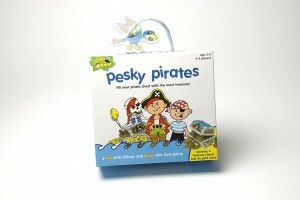 Pesky Pirates is the perfect game for little pirates. It’s not only fun but educational too. The object of the game is for the players to fill their chest with gold doubloons the person with the coins wins. 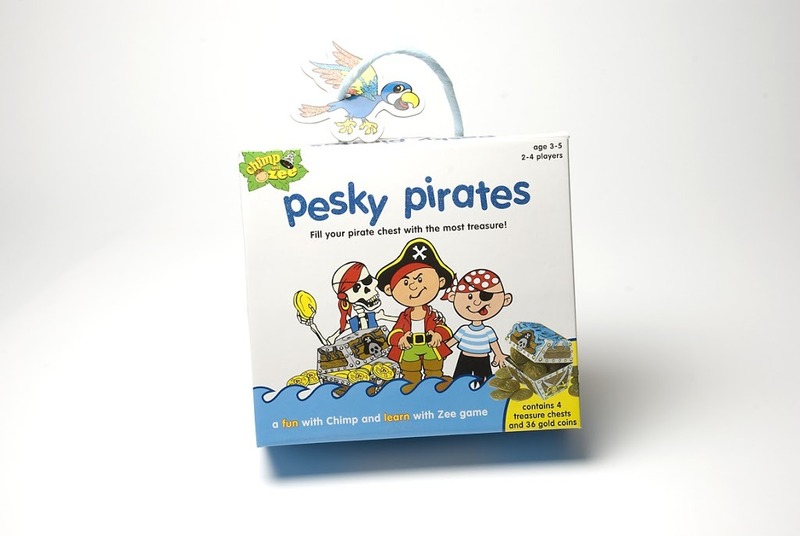 Each step can mean that the pirate adds gold coins or may take them away from another player and watch out for Jolly Roger Pirate It’s great for helping with maths and is a lot of fun, you’ll be giggling away watching the players add and remove coins in each others treasure chests. This is perfect so pre-school to those just started school. Tyler has so much fun with this game, it’s simple and easy to setup and stores away in it’s box which comes with a handy handle. Great stocking filler. 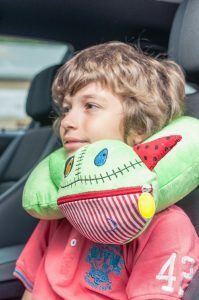 Next is Monstros Airheads, strange name you might think, but they are monstrous and they are filled with air which supports your neck and head. Ahh. Boys will love these, they are funky, fun and yet practical. To inflate you open the zip on the Monstros Airhead, insert the special pump into the air valve and inflate. The pump is kept safe inside the mouth of your Airhead. It’s great for journeys or sitting watching a film and it’s so easy to inflate and deflate. The cover is removable and machine washable should any incidents occur. I think this is a great quirky gift, perfect for giving as a gift or as a stocking filler. My usually good sleeper Tyler hasn’t been so good at sleeping recently. He’s been complaining he’s been afraid of the dark, you may remember the post I did on it. I tried everything from a lamp, leaving the light on, reading books, amongst many others. Then I came across this great little night light called Pabobo Super Nomade Night Light. This looks like a little snowman and lights up very bright for the size of it, when it’s dark. As morning comes it goes off on it own. However, the best thing about it is that it’s cold to touch, it never heats up, not even when placed under the covers. How cool is that? Tyler holds it in his hand all night and it stays cool. The nightlight doesn’t even need batteries, it’s charged via USB and lasts up to one month before needing charged again. If you leave it under the covers it does run out of charge quicker, because it’s always on. You can monitor it’s charge on the little LED panel. It’s battery life is impressive. I love this little light, it’s super cute and had made bedtimes a lot easier. This is perfect for little ones who don’t like the dark, it can be cuddled or even sat next to them. A great investment in my eyes. 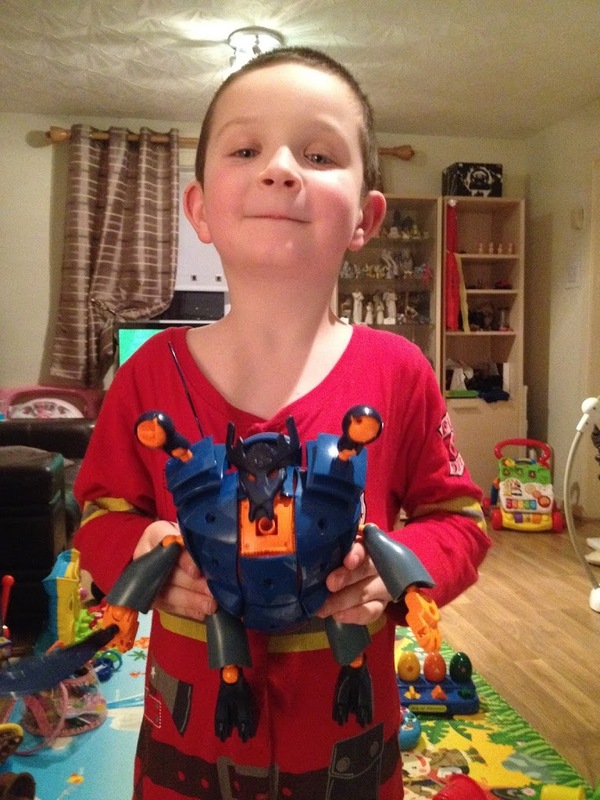 I love playing with toys and I love building them, these Transformers Construct Bots are a great way to bond with your child and have fun at the same time. Lucas loves transformers, but doesn’t quite have the patience yet to build these on his own.We built this together following the instructions. He’s added a few of these to his Christmas list. It doesn’t fall to bits as much as I thought it would. I spend hours building Lego with Lucas only for him to destroy it within minutes, this stays together very well. I was surprised. 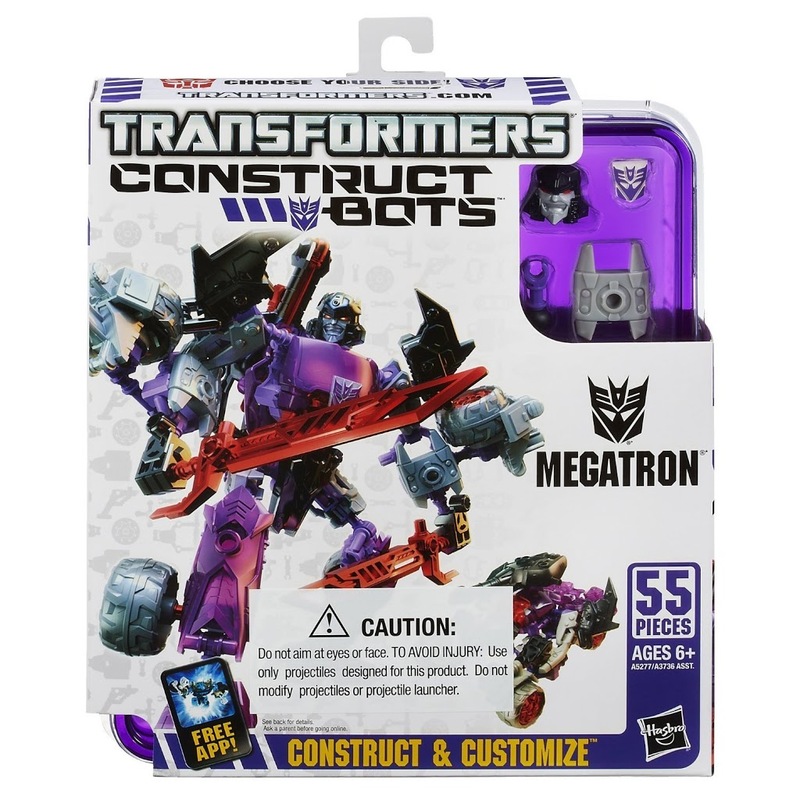 You can convert the robots into the vehicles just like normal transformers do or you can build it as the vehicle and leave it like that. We had lots of fun with this and recommend it. Most kids love Spiderman, what’s not to love? He can swing from building to building on a web that springs from his wrist and he has a cool outfit. Ok, I know nothing about Spiderman, but my boys, especially Tyler loves him. The Electro Web Spiderman is on his Santa list. 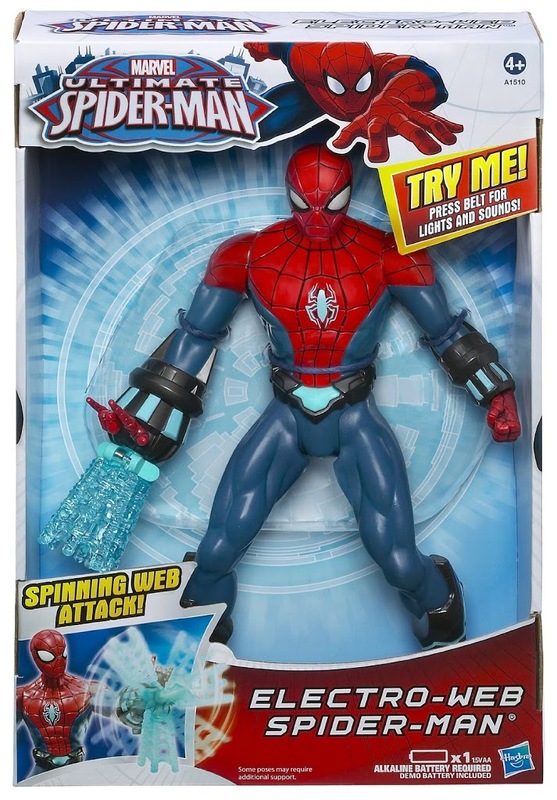 I think this action figure is very cool, his web lights up, spins round and he says 15 different phrases. He looks the part and is a lot of fun for little ones to play with. He can be taken about and there are no bits to fall off and get lost, always a winner in my eyes. 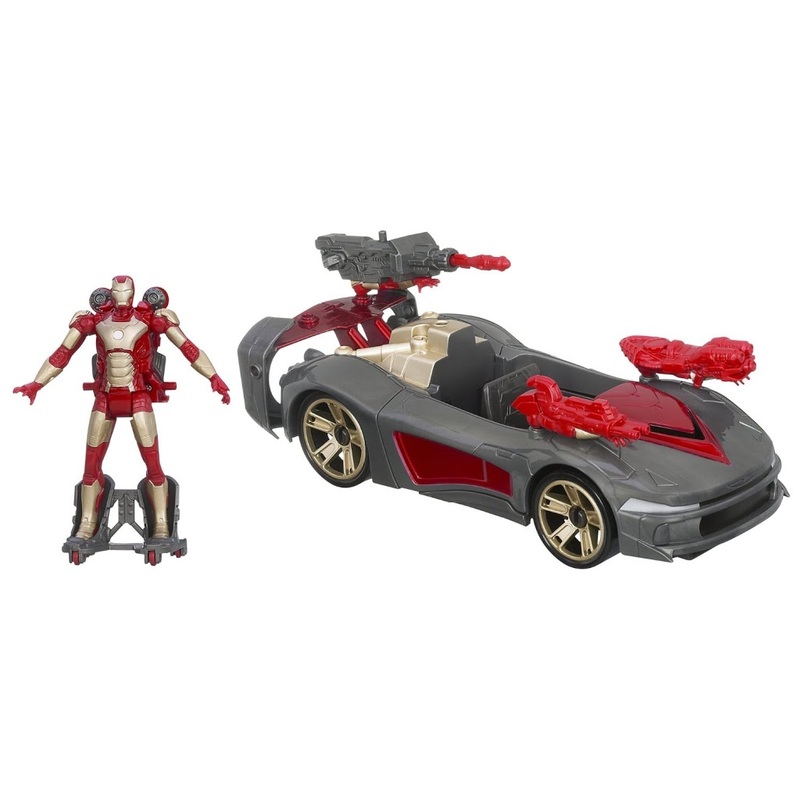 Marvel Iron Man 3 Avengers Assemblers Battle Vehicle is similar to the Spiderman in that it’s a fun action figure which does things. Lucas is the Iron Man fan, although he hasn’t watched the film. This one comes with Iron Man’s repulsor-charged race car. It has a firing weapon and so does Iron Man. Not much to say about it really. The boys will love it and he’s sturdy well made and looks the part. A great gift for little Iron Man fans. Both my boys are big Jigsaw fans, but they are getting older now, they want something more challenging. I didn’t want to go OTT and get them a 1000 piece baked beans impossible puzzle, instead I opted for a 250 piece jigsaw which I thought we could all do together as a family one evening. Maybe boxing day. 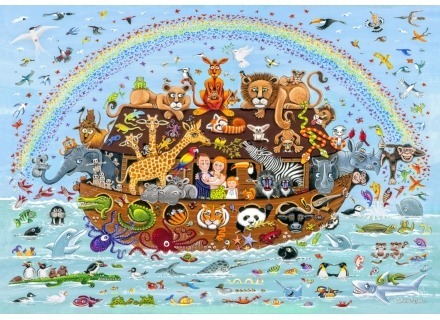 I got a Wentworth Noah’s Ark puzzle, I thought it would suit everyone. It looks great, well made and colourful. I reckon we can tackle this one together. I can’t think of a better way to bond and have fun as a family. My boys love watches, but they never seem to last very long. Lucas has been learning to tell the time and I blogged a month or so ago about whether or not to get a digital or analogue watch for him. I decided to go analogue. 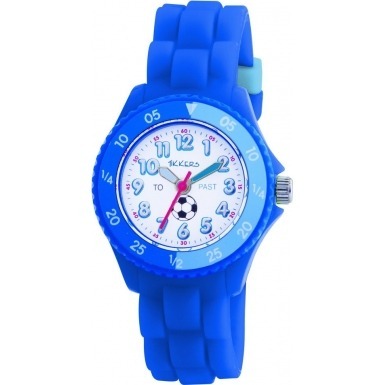 I think this Tikkers watch is perfect for him, it’s sturdy looks great and most importantly to him it has a football on it. A good choice for a football mad boy. The band is made of a thick rubber like material so when the child tried to pull it off it doesn’t snap. These watches are available at the website above and can be found at John Lewis, H Samuel, Debenhams, Fenwick Newcastle and Bentalls Kingston. A great gift for any child. Getting one a watch I had to get the other one a watch. 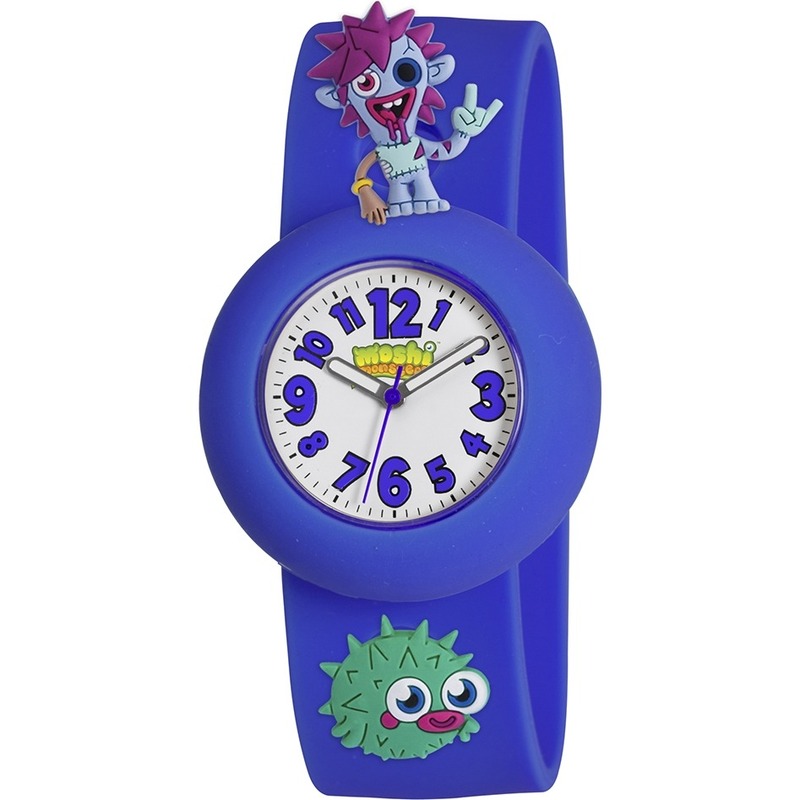 For Tyler I think the Moshi Monster watch was best. Moshi Monsters has been the latest craze for while now and it doesn’t seem to be going anywhere, especially with a film due out this month. This watch is well made, strong and bright. Not only that the Moshi charms pop out and can be changed for others ones you can buy or added too. Don’t get me wrong, they don’t just fall out, it’s designed so that they require an adult to remove them. I love how colourful it is and the strap is very soft and pliable. A great addition for any child. they want. I really cannot praise this enough, it’s very well made and not flimsy in the slightest. It was pleasantly surprised by this product. 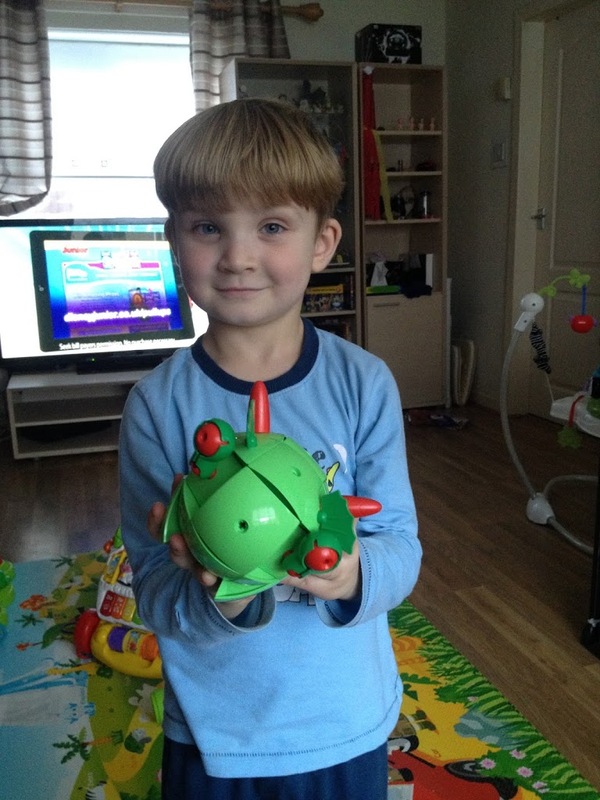 We were also sent the KOR Geomag Tazoo Paco, this one Tyler loved. It looks a bit like a cute dinosaur. Again was so easy to build together and rarely feel apart. Tyler enjoyed having this as an egg and taking the bits out and springing them back into place with the magnet. If you have a boy or a girl who loves toys and to build things, but nothing too fiddly, this is perfect. It’s great fun and easy to build. Santa has a few more of these being delivered on Christmas morning. What items are you looking forward to buying your children this Christmas? Disclaimer:- I was sent some of the above items as stated in the post, others I have purchased myself or just wanted to include. 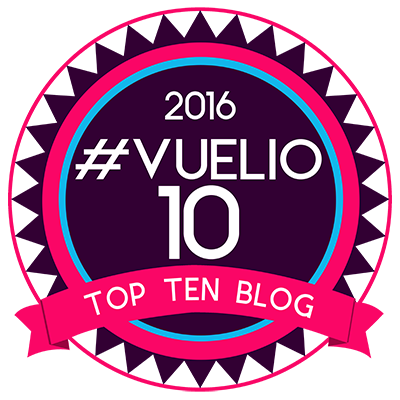 I’ve not been paid further for mentioning any of these products in this post. All words and opinions are my own and the links have been included out of courtesy.